Champion Oil, a globally recognized leader in purpose-built lubricants, announced today that Champion’s Blue Flame® Performance Diesel Motor Oil is now available on-line from the US Autoparts Network, Inc. at http://www.autopartswarehouse.com. Champion Brands Blue Flame® Diesel Motor Oils are a unique, purpose-built synthetic diesel engine oils that combines workhorse high-zinc performance additives, superior protection, advanced polymer technology, and high TBN, supported by synthetic base stocks. 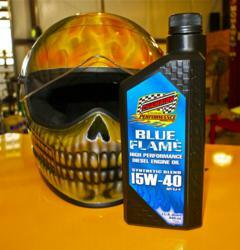 In addition, Champion Brands Classic Blue Flame® Diesel Engine Oils deliver unmatched high temperature film strength and lubricity protection, has the muscle to combat oil shear, maximizes and sustains cylinder compression, and is proven to increase engine horse power and torque. U.S. Auto Parts Network, Inc. is a leading online provider of auto and truck aftermarket parts, including body parts, engine parts, performance parts and accessories. U.S. Auto Parts provides individual consumers with a broad selection of competitively priced products that are mapped by a proprietary product database to product applications based on vehicle makes, models and years.